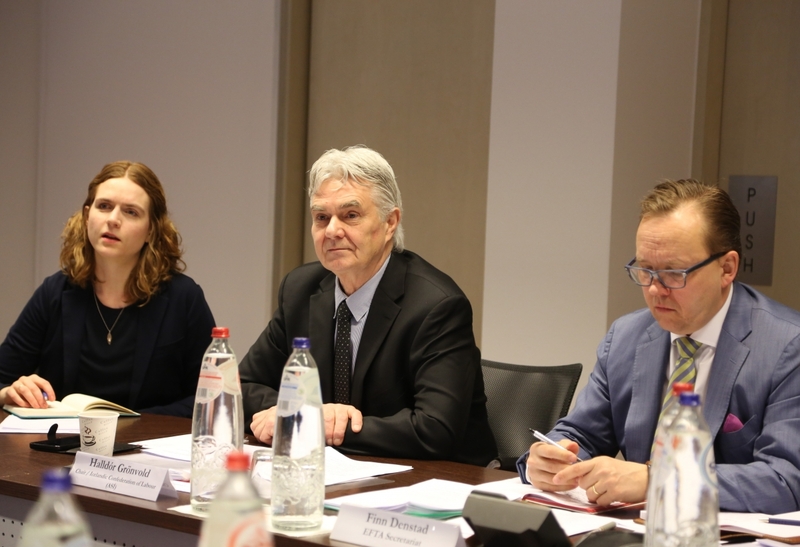 The EFTA Consultative Committee (EFTA CC), convened in Brussels on 19 and 20 March 2019 to meet with the EFTA Standing Committee and to have discussions on Brexit. The EFTA CC, which is an advisory body to EFTA, brings together representatives of labour unions and employers’ associations in the four EFTA countries. The Committee has a rotating chairmanship and in 2019 is chaired by Halldór Grönvold, Deputy Secretary-General of the Icelandic Confederation of Labour. On 19 March, the Committee met with the EFTA Standing Committee for a dialogue on developments and future perspectives in the EEA and EFTA relations with the EU. The Standing Committee, which consists of Ambassadors to the EU from Iceland, Liechtenstein, Norway and Switzerland, briefed the Committee and discussed issues such as Brexit, developments at the EU and European level and challenges ahead for EFTA and its Member States. There was also an exchange on events to mark the 25 year anniversary of the EEA Agreement this year. On 20 March, the EFTA CC had meetings with several of the key actors on Brexit. First, Georg Riekeles and Nina Obermaier from the Cabinet of Michel Barnier, the EU Chief Negotiator on Brexit, provided a status update and gave their reflections. This was followed by a discussion with Danuta Hübner MEP, who is Chair of the EP Constitutional Committee and member of the Brexit Steering Group. Hermione Gough, Director of UK-EU Relations at the UK Permanent Representation to the EU then gave her perspectives on the process and possible ways forward, supported by Gian Marco Currado and Ivan Smyth, Counsellors at the UK PermRep. The meetings on Brexit ended with an exchange with Ambassador Sabine Monauni, Chair of the EFTA Standing Committee, and EFTA Deputy Secretary-General and Brexit Coordinator Andri Lúthersson. The EFTA Consultative Committee also met EFTA Working Groups and European experts to discuss new forms of employment. Find high-resolution pictures from the meetings here.